While searching for an ideal hydration pack for yourself might be exhausting, it gets worse when searching one for your kid. That’s why we sifted through the various options, tested some of the top-rated hydration packs for kids (on children of varied ages) and came up with the list below. To say that this list is among the best on kids’ hydration packs would be a gross trivialization. Quite honestly, we think there isn’t a better review out there. So you can, without a second thought, pick one from the list below, fill its reservoir, add some snacks and have fun taking your kid with you for that hike or ride! The best hydration backpacks for kids? This pack from Osprey ranks best for short trips as it is made for kids who travel lightly. With an overall capacity of 6.4 ounces, it measures 13 by 8 by 3 inches, a perfect fit for most kids. The light load boosts their speed and is one other thing that they do not need to worry about. It has just enough capacity for necessities such as a layer and some snacks as well as a water capacity of 1.5 liters; this pack is perfect for a short outdoor adventure. To improve your kid’s access to essentials, there is an external zippered pocket which not only stores your kid’s items such as snacks but also ensures that they are secure. The panel load access ensures that loading and offloading gear is easy. It also has a magnetic bite valve attachment on the chest strap from which your child can drink. The magnetic attachment ensures that the mouth piece remains closed and immune to entry of dust. Furthermore, this back of the pack is rigid and hangs exceptionally well on a child’s back owing to the fact that the straps are adjustable. With this pack, you are guaranteed that there will be no leakages. The kids can also refill the bladder on their own as the cap width is accommodating of this feature. If you are worried about any choking hazards from the mouthpiece, then this is the perfect pack for your kid as the mouthpiece is tightly attached to the hose. The quick access of this pack, will ensure on-the-go hydration for your kid. All your kid has to do in order to access the main compartment which hosts the reservoir, is to open through the zippered front panel. It also has a front shove it pocket which is ideal for a quick layer change. There will be no need to slow down or stop for this change. While designing this pack, Ospey undoubtedly had your kid’s security in mind. Endowed with a back attachment where you can attach a blinker light, convenience at night is guaranteed. The blinker light attachment is located at the base of the front panel of the pack, ensuring visibility at night or in dark areas. Another reason to invest in this pack is the appealing colors it comes in. The grasshopper green and wild blue colors will certainly be attractive to kids who love bright and outstanding packages. The drinking tube is not insulated meaning that this pack would not be ideal for a skiing experience as your water would most likely freeze. It also comes as a disadvantage that the bladder is not located in a separate compartment meaning that it is susceptible to damage from your other cargo. The pack is perfect for your three to five year old but the minimized storage space may not be suitable for older kids. Equipped with features such as a chest strap that keeps the load steady and a magnetic bite valve attached to it that guarantee your child’s comfort and even goes out to ensure your kid’s security with the installment of a safety whistle, we highly recommend the Osprey Pack Kids Moki Hydration backpack for hiking. We rate it at 4.6 out of five stars. This pack from Osprey measures 15 by 10 by 7 inches and weighs 12 ounces. You can choose either the real teal or strawberry red colors that the pack comes in. This pack has the advantage of having a larger storage capacity than the Ospreys Kid’s Moki which can accommodate an extra change of clothes or even a rain jacket. As such, the extra storage capacity makes it have a wider age range of wearers as it can fit a six to ten year old. This pack is embellished with features found in the adult pack that enhance comfort such as a mesh back panel for ventilation. It also has an Inside mesh pocket where you can shove delicate items such as sunglasses. Its shoulder harness is also fleece-lined providing further comfort for the wearer in addition to the hip-belt that distributes the load. Because activities such as hiking usually result in sweating, this pack has a mesh backing which enhances breathability. The 1.5 liter (34 ounces) hydraulics lt reservoir it comes with is located at the eternal reservoir sleeve. The reservoir is easy to clean and fill. It comes with a magnetic bite valve that falls back into place after sipping from it. With this pack, you can access the main compartment easily through its front panel. Furthermore, the front panel bungee provides extra storage for essentials that need quick access. Its side pockets can be used to hold even more necessities. This pack has a safety whistle that alerts you of your kid’s whereabouts in case of danger. This pack ranks as the best overall for hiking. It accommodates a wider age range with a longer torso, has more room for storage, guarantees no leakages from the bladder and ensures that your kid is well ventilated on the go. It is everything you would expect out of a hydration backpack instilled into a smaller size and we rate it at 4.8 out of five stars owing to the fact that it has very beneficial features and little to no demerits. If keeping your kid hydrated is your main concern then this is your best bet. 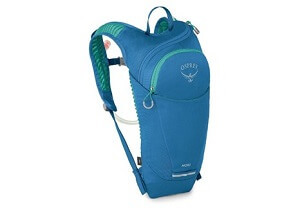 Its bladder delivers 20% more water per sip as compared to the average hydration pack. This Lightweight pack from CamelBak is a comfortable fit which measures 15 by 10.2 by 2.6 inches and weighs 1.05 pounds (16.8 ounces). You can choose from the appealing colors such as crimson red & blue, maui blue print and purple sapphire & azalea. With such a short torso length, it is perfect for kids of five to twelve years. This pack has enough room for your kid to store a rain jacket as well as other essentials. The pack is endowed with a mesh back panel which prevents sweating by keeping your kid’s back ventilated. It also has a sternum strap to keep the load in place. This pack is equipped with the latest hydration technology that CamelBak has invested in. For starters, the 1.5 liter (50 Oz) Crux Reservoir it comes with is constructed in such a way that it delivers 20% more water per sip. Its bite valve also has an on/off mechanism that ensures that after flicking it off, there will certainly be no leakages. The bladder’s cap closes easily with only a few twists so you will not strain to do so. Not only does it close easily but also tightly so you will not have to worry about sloshing. Furthermore, its wide cap ensures that it is easy to clean, fill and refill. This pack is a great investment as the bladder is removable making the pack double entirely as a backpack. Its drinking tube has anti-microbial hydroguard coating which means that the growth of bacteria within the tube is inhibited. If you need to know just how this pack is tailored for your kid, check the transparent front pocket it boasts off where your kid can shove and display all the cool items found along the trail! The pack has reflective material on the front stripe and back of both arms which accentuates their visibility at nighttime. As if that is not enough it has a safety whistle located on the sternum strap which enhances your kid’s security. The extra features further include a name patch which your kid can use for personalization of the pack. In as much as the bladder’s cap is wide enough to instill ice cubes, its tube is non-insulated. This means that water temperate may be affected and not be as cool as you would need after and during that outdoor escapade. The purpose of a hydration backpack is to ensure that a person remains rejuvenated as they partake in an outdoor activity. This pack precisely meets this need by delivering twenty percent more water per sip. It also has a plethora of additional features showcasing just how deliberate the making of this pack was. As such, it is one of the best kid’s hydration packs for hiking and we rate it at 4.6 stars. 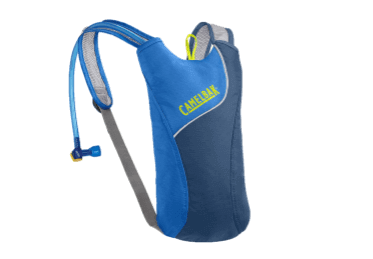 This lightweight hydration pack from CamelBak made for unisex kids measures 13 by 7 by 1 inches and weighs 9.8 ounces. It come in one color; that is Poseidon/ electric blue. As compared to other CamelBak packs, the Skeeter has a storage capacity limited to the most necessary essentials only. As such, this pack would be a perfect choice for you if your kid has an uncontrollable behavior of stashing every kind of stuff into the hydration pack. This pack has a low profile build which enhances comfort as it keeps the weight off of the shoulders of your kid. This is especially handy as by the end of the adventure, your kid will not be too worn out. The reservoir it comes with has a water capacity of 1.5 liters (51 fluid ounces). It also has a unique bite valve which is bigger than most other reservoirs enabling more water intake per sip. The bladder’s cap is easy to open and close and thereby easy to clean and refill as well. It also has Jersey pockets for easy access to essentials. The pack has reflective strips which are not only appealing to kids but also ensure that you can easily locate them. Furthermore, the Nylon material that it is made of guarantees durability so this pack is definitely a worthy investment as it will not serve a short-time purpose. This pack ranks as top overall for comfort owing to its low profile design. With essential features of a good hydration pack, we rate it at 4.4. out of five stars. If a hydration pack that meets the eye is what you are looking for then look no further. This pack from CamelBak, measuring 14 by 7.5 by 7.7 inches and weighing 7.2 ounces is the pack for you. You can choose from the Atomic Blue & Navy Blazer, Azaela & Aruba Blue, Baton Rouge with flames, and Black with Flames colors that it comes in. The pack is made for the teen boys and fits torso between 12 and 16 inches. The CamelBak Kids Mini Mule has an overall gear capacity of 50 ounces. Although it has less storage space as compared to the CamelBak Scout hydration pack, it is still big enough for carriage of essentials and addition of a rain shell and snacks. Its zippered compartments are handy for that extra storage of essentials and layers. It is very effective for a biking experience as it has a tool organizer pocket where bike essentials can be stored. Ventilation is guaranteed as the pack has padded mesh. The pack’s straps also steady the load on your kid’s back. Its features are similar to the CamelBak 2019 Kids Scout Hydration Pack in that it features the 1.5 liter Crux reservoir that supplies 20% more water per sip, an on/off bite valve, leak-proof cap and drinking tube with anti-microbial hydroguard coating that is free of BPA, BPS and BPF. This pack’s reflective strips not only add to the visibility in low-light environments but also make it easier for you to spot your kids in general lights. Its bladder also has an ergonomic handle for ease of refilling and cleaning. The convenience goes into the bladder’s hose which can also be disconnected from the bladder giving you an eased cleaning experience. Much like the aforementioned hydration packs, this pack includes a safety whistle for security purposes. Taking the bladder out of the pack might be a bit hectic as you have to unhook it in order to clean and refill. Furthermore, there is no attachment area for the mouthpiece of the bladder and this might be displeasing when running. We highly recommend the CamelBak mini M.U.L.E pack for hiking, biking and other outdoor adventures. We rate it at 4.4 out of five stars as it has less features in comparison to the kids hydration packs that we have enlisted. 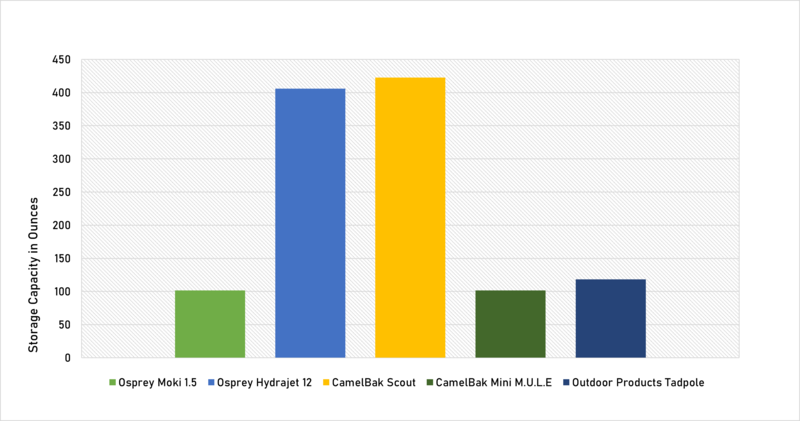 From this graph, you can observe that the CamelBak Scout emerges as top capacity hydration pack with 16 ounces. As such, it is more suitable for older kids as compared to the others. Even so, you will want to consider the build of a pack since it might still bar extra carriage despite its capacity. We rank the Osprey's Moki hydration pack as the best for a short trip that requires little cargo but worst for older kids who require extra storage and longer hikes. 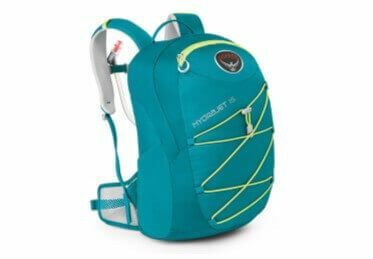 The Osprey Packs Kids Hydrajet hydration pack is however our go to for all necessities for a good hydration pack for kids. Kids are always trying to look cool. What a better way than staying hydrated with a system that does not entail walking around with a water bottle? A hydration backpack not only keeps them from being desiccated but also doubles up as a backpack with enough storage for an array of things they are likely to pick up during their adventure. Even with this list of the best hydration packs for kids in the market, finding a hydration backpack that suits your kid may still be exhausting. If you have no prior insight on what you should look out for and why, we have done the heavy work so all you have to do is follow these procedures and your kid will be ready to go for that hike, biking or camping experience. Listed below are the broken down essentials that you need to look out for if you are by any chance to pick up the best hydration pack for your kid. Kids are always trying to look cool. What better way is there than staying hydrated with a system that does not entail walking around with a water bottle? A hydration backpack not only keeps them from being desiccated but also doubles up as a backpack with enough storage for an array of things they are likely to pick up during their adventure. It is important to know your child’s weight to determine their carrying capacity. The average child should not carry a load that weighs more than twenty percent of their weight. If your child weighs 70 pounds for instance, his load should not exceed 14 pounds. The overall carrying capacity of a pack sometimes hugely determines the amount of load as more often than not your kid will be excited to fill the pack with random things. That said, you might want to look for a pack that is lightweight and with just enough storage capacity. You’ve already checked for the storage capacity and known that the more storage space for cool stuff, the better it is for kids. Now, you need to ensure that the pack you want to purchase is going to be comfortable, be it with a light or heavier load. Ask yourself, are there deliberate efforts to ensure that your kid is comfortable while carrying the pack? For instance, chest straps which stabilize the load or even a magnetic feature on the straps that keeps the drinking tube in place. Will your child be well ventilated or will they have that uncomfortable streak of sweat rolling down their back? Comfort is enhanced by the correct fit to a pack. Therefore look at the pack’s measurements to determine whether or not it is appropriate for your kid. Similarly, look into whether the pack’s straps are adjustable or not. It is advisable to get a pack with adjustable straps than fixed straps as your kid will most likely outgrow the latter. Keep an eye on these additions as your kid will only enjoy that trip if he or she is comfortable. There are a few visible signs that will point out to whether using the pack will be natural or a bit of a struggle. Consider how easy it is to fill and clean the reservoir and even go as far as scrutinizing how easy it is to drink from the bite valve. Remember, while you might not mind drinking from your water bottle, kids are entirely different as they prefer a simpler method of keeping them rejuvenated. The most important consideration is how much liquid the reservoir can hold. If you are a frequent hiker, it is easy to determine how much water you need. However, for first time hiking with kids, you need to take into account the fitness level of your kid, difficulty of the hike and even the temperature for that day as they are determinants of how much water should be consumed. Typically, children require 33 fluid ounces for every hour of hiking. You do not want the experience to be contending for them so ensure that they have just the right amount of water for that adventure. Other features to look into include insulation features of the pack, the anti-bacterial measures and not forgetting the measures taken to avoid sloshing. Unlike most adults who will settle for a darker hydration pack, kids always go for the alluring colors. And while you might be concerned with how hydrated they are; their focus is on how the pack looks on them. Bright colors are therefore key in this case. To have the upper hand choose a pack that essentially serves its hydration purposes but also looks appealing. With these five essentials you can then look for extra features that are compelling to you if you are still undecided. Now your kid is ready for that outdoor activity!